With around 130 flights daily between India’s political capital and the commercial capital, Mumbai-New Delhi was the third busiest air route in the world last year. A total of 47,462 scheduled flights were operated between the two airports in 2017, next only to South Korea’s Seoul Gimpo-Jeju route (64,991flights) and Australia’s Melbourne-Sydney (54,519), according to data released by the UK’s OAG Aviation Worldwide, an air travel intelligence company. 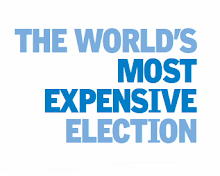 The ranking is based on flights operated between two airports and not two cities. 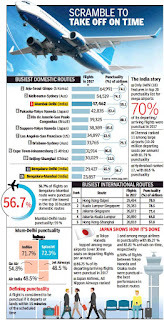 Unlike megacities such as New York and London, Mumbai and Delhi have only one major airport each, so all their air traffic is routed from these two airports. 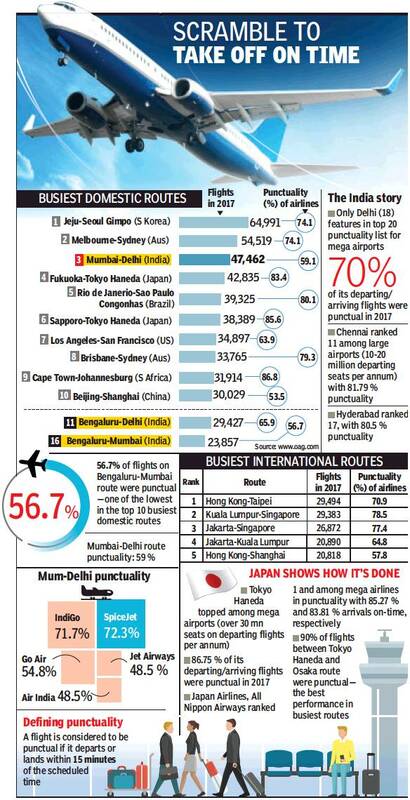 When it comes to punctuality on the list of 20 busiest domestic routes, the Mumbai-Delhi route recorded an OTP of 59.1% — among the worst. The best was the Tokyo Haneda-Osaka (17th busiest, 21,900 flights) seeing 90.4% flights leaving and landing within 15 minutes of their scheduled time, which OAG counts as on time.